We believe communication, diversity, and free flowing ideas is first and foremost a product of density and adjacency in the urban environment, leading to exposure and communication of ideas across socio-economic and cultural spectrums. We believe in the need to encourage density through increased opportunity of ownership throughout Seattle’s vast single-family zoning districts. 1. Collective co-op ownership developments at main transit corridors. These structures will have minimal individual amenities, with an emphasis on communal spaces in order to provide low cost ownership opportunity and encourage dialogue through density. 2. Utilize low density neighborhoods for creative solutions to allow micro-homes in the rear setbacks of existing homes. This not only allows for homeowners to invest in existing properties, but the micro home scale will provide an affordable low barrier to entry market for home ownership. 3. Advances in automotive and mass transit systems will eventually allow for the closure of secondary side streets, allowing for development of these micro-homes in previous public rights of way. For the purposes of this year’s grant we propose the construction of a singular Future Folly located at the intersection of Market Street and Leary Avenue in the Ballard neighborhood – a neighborhood which not only exemplifies the low-density problem of the urban environment, but also some of the solutions (good and bad) being implemented today. The folly will serve as a dynamic and intimate space in which people can come together to communicate and exchange ideas. The folly will also house an exhibition of the research of this proposal to raise awareness on density, adjacency, and communication. In facilitating this increase in density and adjacency, the Future Folly represents a Parti, or diagram, for the thesis. 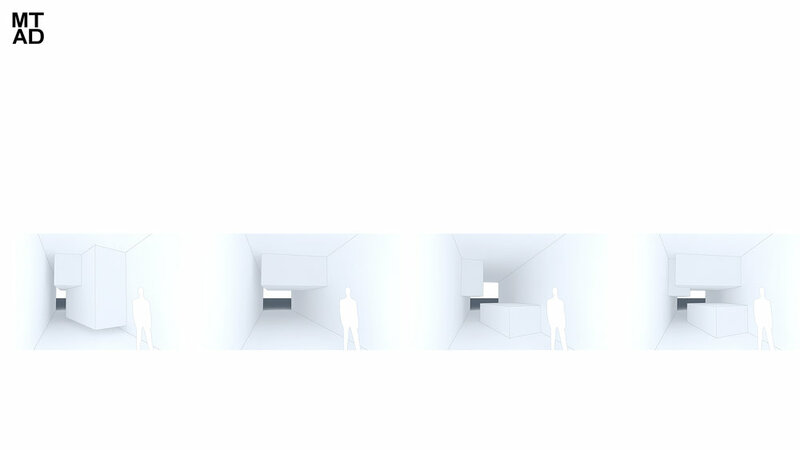 Consisting of a series of dynamic occupiable volumes which intersect one another in order to create interstitial moments on the interior, are then inserted into an exterior envelope. This exterior form is referential to the prototypical Seattle ‘Bungalow’ found in the typical low density single-family residential neighborhoods. This structure will be constructed with welded 2” square steel tube, and then wrapped with a fine translucent black mesh cloth; allowing for the volumes to be perceived from the exterior but not reveal the interior spaces. These forms will be made from 3/4” plywood and sealed with a clear finish. The three main interior spaces will be the entrance/gallery, the conversation/meeting room with seats, and the vertical viewing/display space. 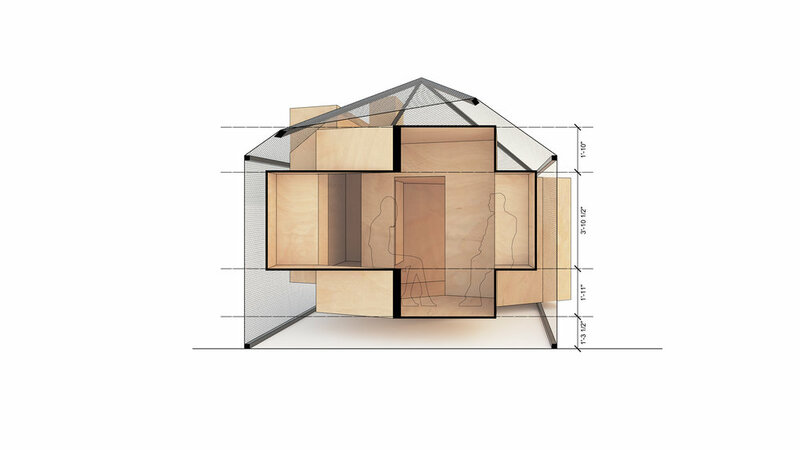 The folly serves as a diagram for the research – relying on Seattle’s existing low-density framework to bring people and connect them through conversation and interaction. We envision a grand research project encompassing three phases to explore means and methods to encourage communication through increased density and adjacency in Seattle. Following the introduction of the singular Future Folly in Ballard, the first phase of the larger project in which a series of follies will be placed throughout Seattle in an effort to encourage communication and adjacency, particularly within homogeneous communities and those which require added density. These follies will allow for intimate conversation and the exchange of ideas between the people within each folly, but will also be connected digitally allowing for communication between follies. Following the first phase, we envision a future in which zoning resolutions are modified to allow for increased mother-in-law cabins and apartment/co-op buildings throughout single-family residential neighborhoods. Allowing the use of these micro-homes in the rear yards of existing single-family lots (mother-in-law cabins) will allow for an increase in ownership opportunities with a low barrier to entry in expensive neighborhoods with low density. This strategy will also allow for home owners to invest in their existing properties while allowing more density and adjacencies in these neighborhoods. The apartment buildings will be located along major transportation corridors. A series of intersecting spaces will not only create individual units for buyers, but will allow for common interstitial space. Individual units will have bare bones amenities, with an emphasis on common amenities. This will both increase affordability and entry to ownership, while at the same time encouraging contact and communication through the use of these collective spaces. For instance, the emphasis is on the communal kitchen rather than the private terrace; the communal garden rather than the massive kitchen. The final phase exists at a time in which advances in automotive and mass transit systems will eventually allow for the closure of secondary side streets. This would allow for the parceling of previous public and utility areas into either public park land, or private parcels for development of micro-homes tapping into public infrastructure. These homes will be both private residences and commercial spaces either with storefronts or actual work spaces. The addition of these new structures will increase density and affordable ownership opportunities and allow individuals to take back roadways no longer necessary. This intervention will create truly mixed-use neighborhoods rather than commercial strips – where individuals can work, shop, eat, and reside in their neighborhoods.